strongly ests a co lon-s6st epidemic pattern. cials is coil s still obscure. and Scarlet fever ............ 6,161 6,460 --- 190,085 173,703 . Tetanus ........................ 6 9 --- 81 69 ..
Tularemia ...................... 8 5 --- 80 97 . **Revaccinated within 8 days of onset. diagrammatically in the accompanying figure. ing day by the laboratory. (Case 6) and her nephew(Case 7) the first identified case. as compared with an expected weekly average of 11,375. NOTF: All deaths by place of occurrence. vaccinated in the hospital's annual revaccination program. drug eruption prior to her diagnosis of smallpox on May 15. The credits for the report Equine Influenza, MMIR. Vol. 12, No. 19, Page 157, erroneously identified Dr.
lic Health, New Jersey State Department of Health. 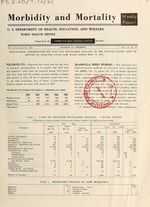 Public Health, Florida State Board of Health.